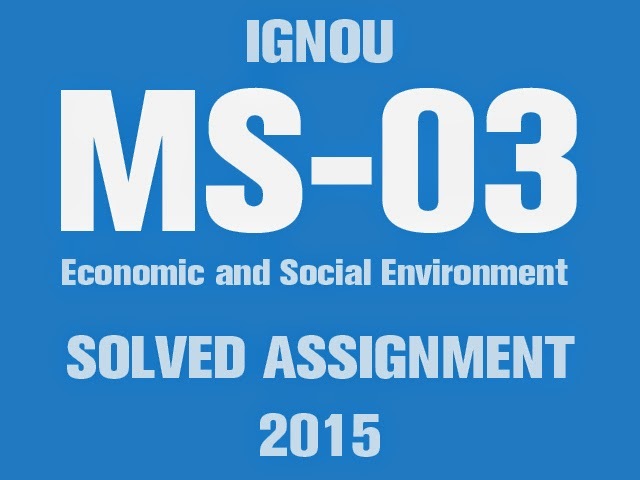 All IGNOU Management Programme students can download MS-03 Solved Assignment 2015 for free exclusively on myignou.in. Economic and Social Environment (MS-03 or MS-3) can be directly downloaded by clicking on the following download button below. 1. Explain environment of business in detail and examine the interaction between economic environment and business management giving suitable examples. Share "IGNOU MS-03 Solved Assignment 2015"
Share this page (IGNOU MS-03 Solved Assignment 2015) to let others know about it! While downloading this Ms-03 soled assignment it was showing solved assignment of ms-02. Even i found the same problem arti.pls do the needful as soon as possible. the download link is fixed thanks for the comment. can u pls upload the ms7 and ms21 assignment of 2015.i would be very thankful to u.
I can only upload MS-07 in a couple of days and sorry for MS-21 as I can not guarantee whether it will be uploaded or not. Ok thanks.but y ms21cant b uploaded.pls help. Plz upload ms7 Assignment 2015.